Plus Size Bridal Gowns - your guide to finding the one! Do you feel overwhelmed looking at or even trying on plus size bridal gowns? Do you know what styles you should be looking for? Do you want to be able to confidently say “YES” when it comes time to pick the perfect wedding dress? Of course you do! No one wants to hear a meek, wishy washy “Yes”? This is your day and you want to feel and look beautiful for your groom and yourself. I am not going to sugar coat it though, shopping for your wedding gown, whether it's your first wedding or second wedding, is no easy feat. Determine your body shape. Are you an apple, pear, inverted triangle, straight or an hourglass figure? Know what dress styles look the best on your body shape (A-line, empire, etc.). You can take the leap and assume the same style in a wedding gown will flatter your figure as well. 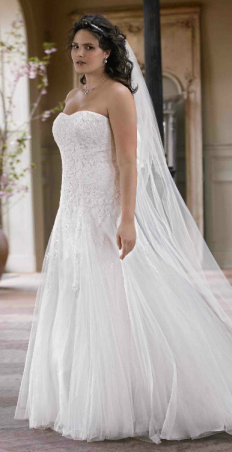 Click here to see which plus size wedding gown styles are flattering to each body type. What is your personal style? Do you like simple wedding dresses or elaborate, formal ball gowns? Determine what shade of white is flattering on your skin tone. To find out what your skin tone is click here colors for skin tones. Your wedding dress color also plays an important part in deciding on the color for your bridesmaids dresses. What time of year are you getting married. Do you need to look for winter wedding gowns or summer wedding dresses? Keep your age in mind. If you are an older bride, always go for elegance and class. Know what necklines are flattering on you. For plus size women, look for open necklines. Identify your positive features (don’t say you don’t have one). All women have beauty! You want to accentuate your best features. Identify your problem areas; areas that you would like to minimize. More than anything, don’t get your heart set on any one style. Be open minded! The best gown for you may be completely different than what you envisioned yourself in. If you are plus size, click here to find out more about what to look for when shopping for your dress. There are many options you may have not considered or are even aware of. For example, have you thought about color? Blue wedding dresses and pink wedding dresses among other colors are becoming very popular today Not every bride looks good in white or even wants to wear white. Once you have your gown, your mom can start looking for her dress. The color of her dress should complement your gown. Click her Mother of the Bride Gowns for more information. AND FOR YOUR PLUS SIZE BRIDESMAIDS, you will also need to do your homework and find styles that will make all your bridesmaids look beautiful too. Click here PLUS SIZE BRIDESMAIDS DRESSES for more information. It's tough out there and not all women are fortunate enough to buy clothing for interviewing or the workplace. Dress For Success is a worldwide, charitable organization that provides professional attire for underprivileged women. They also promote economic independence and provide career development tools. See how you can help give women self-esteem and hope for their future.